Last Sunday began in an unusual way – it was Resurrection Sunday and we hosted a sunrise service on our patio! It was also one of our son’s 12th birthday ! Little did we know the hail damage in the vineyard that was to come! There were storms clouds in the area but according to radar, they were not suppose to hit us. Ooops, the radar was wrong! Not only did the thunderstorm hit, it sat over us for about 3 hours. We had lots and lots of pellet sized hail but it was also as large as 1 1/4 inches! I cannot describe how horrendous is sounded on our metal roof! As I sat listening, I thought the worse that could happen was that we would not be able to finish the house and the guys would have to get jobs to pay for living expenses. It is funny what goes through your mind isn’t it? At this point, we are estimating an 80% crop loss. 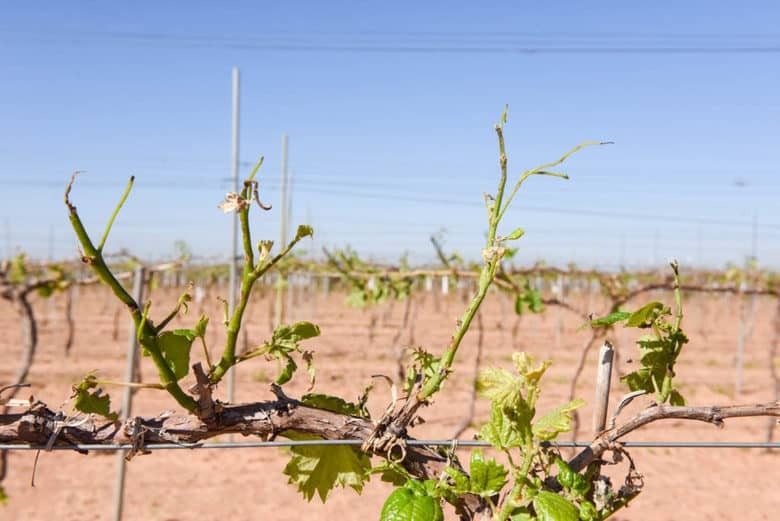 You can see from the first photo and the following ones, the amount of damage the vines sustained. What were 12 – 14 inch shoots are now 4 – 6 inches or no longer there! 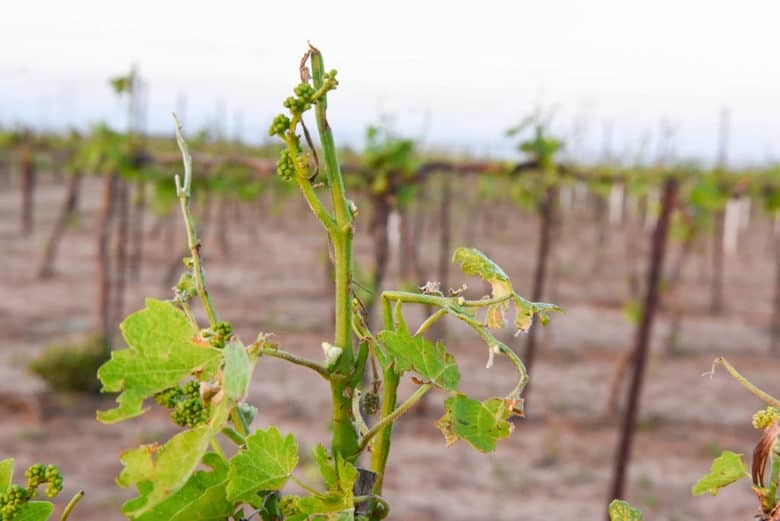 Here is a close-up of the hail damage in the vineyard. 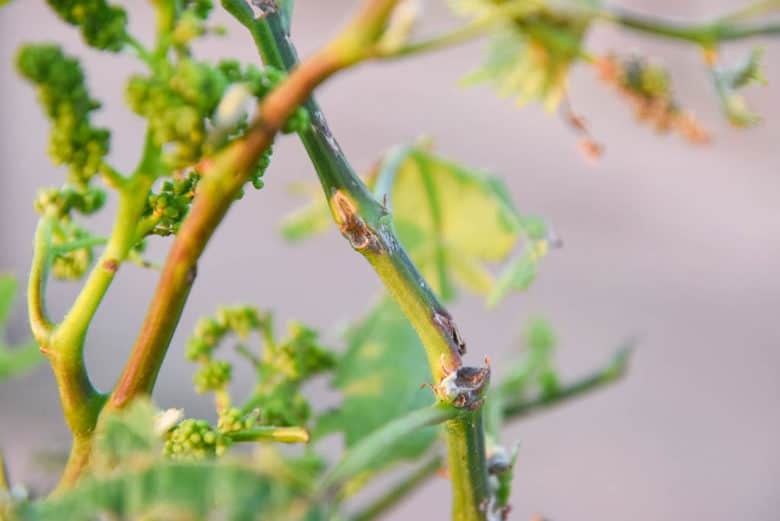 The vines have brown spots and wounds that look like a mouse nibbled on them! Other vines look like their tips were cut off and shoots broken off. It is exciting that even with the hail damage in the vineyard, the trunks and arms suffered no wood damage. That would mean a lot of re-training and crop loss for a couple of years! In the next couple of photos, you can see some of the new buds that have opened since last Sunday.They have bloom clusters which should yield fruit! 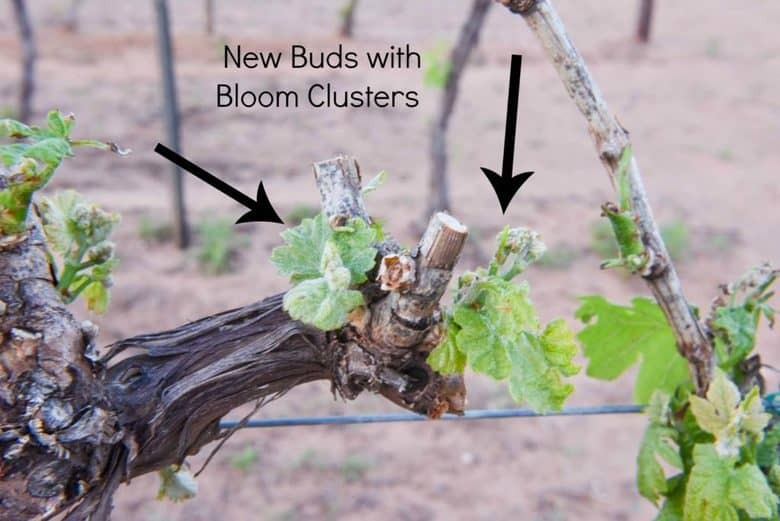 These late buds are a result of our late pruning which delays bud break. It really is amazing to see the new buds right next to the hail damage. Here are 2 new buds. In the center you can see a spur with a brown circle (sorta like a rose) on it. That was where a bud was, but has been damaged and knocked off. Besides the hail damage in the vineyard, the greenhouse also took a pounding. Below you can see that the roof is now more like a sieve! 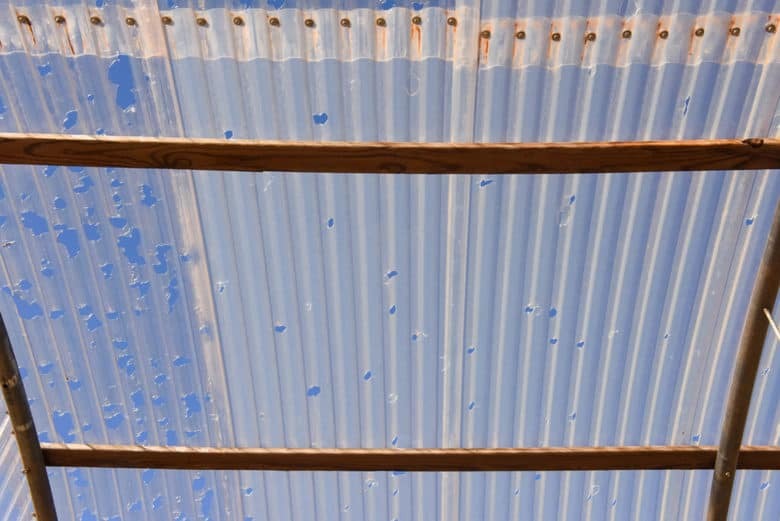 The good news is that the poly-carbonate roof slowed the hail so that we only lost one seedling – a jalapeno pepper plant. 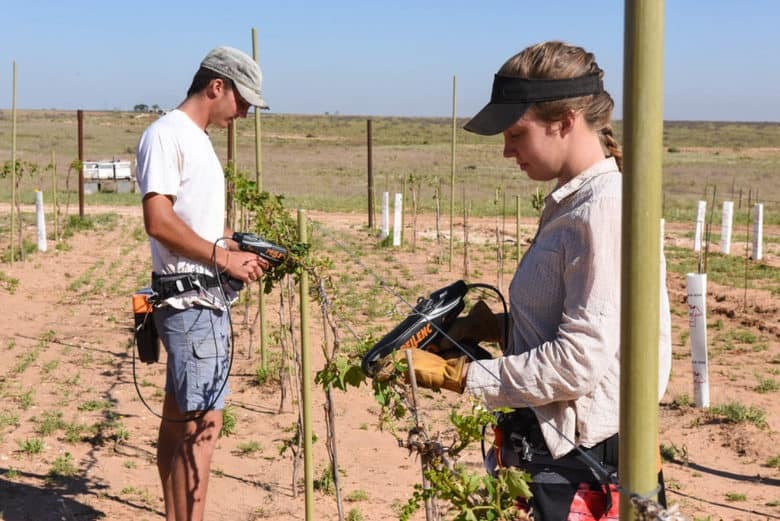 Work in the vineyard is continuing. 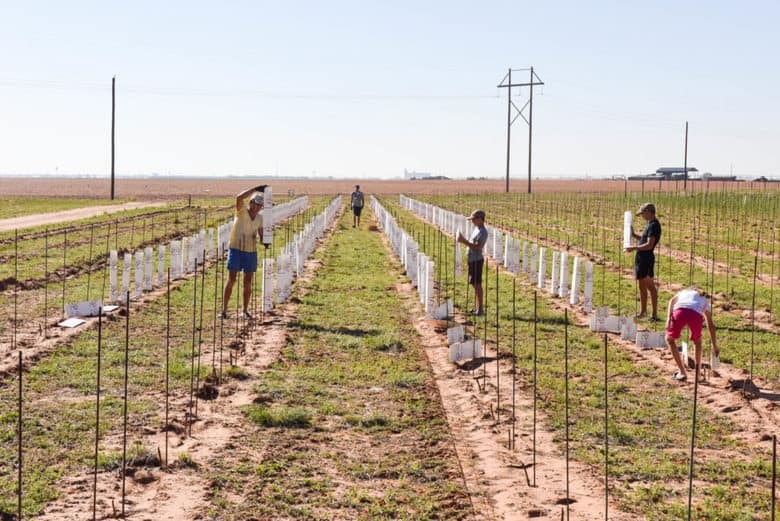 With the new planting of Albarino and Roussanne, there is much to do. First, a stick of rebar is placed by each plant and then a carton is placed over it. 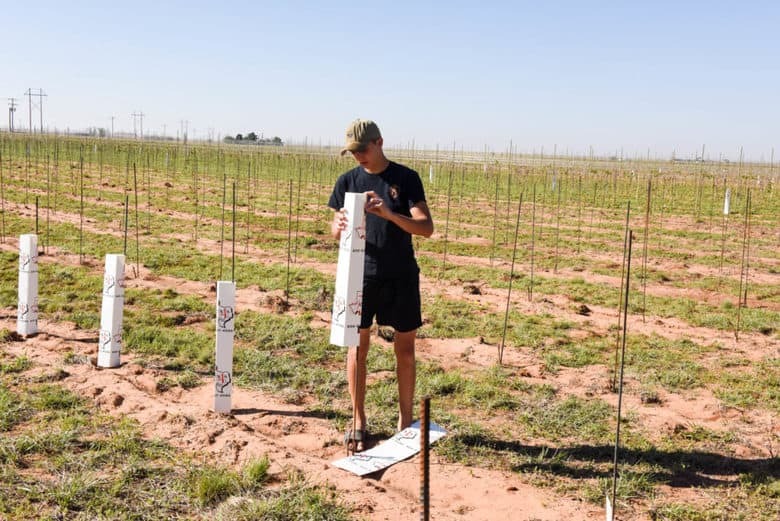 The cartons protect the young vines from rabbits and also help focus their growth upward. The cartons come flat and each carton must be opened individually. They are then slid over the rebar which helps support it in our high winds. We have used bamboo sticks in the past but they tend to break and fall over in the wind. After only being in the ground for about 10 days, the new vines are already beginning to push buds! 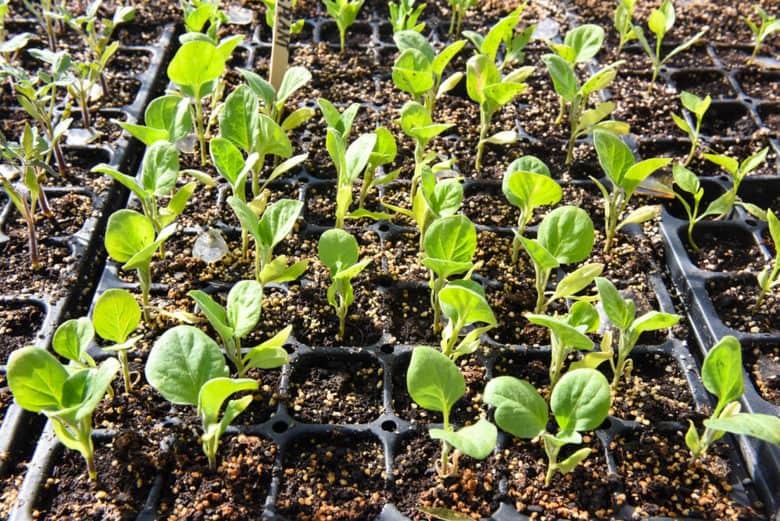 We are so thankful that we did not plant earlier – the new shoots would have been devastated by the hail! 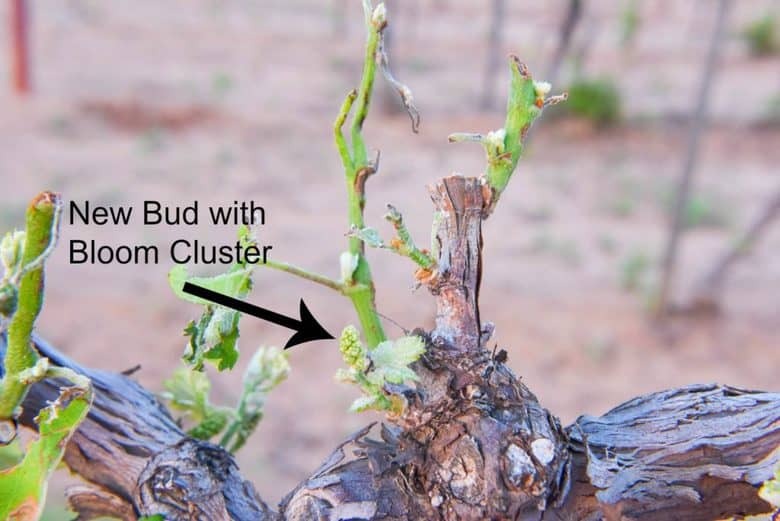 In the photo below, the arrows point to the new buds and you can see the stick of rebar behind the vine. 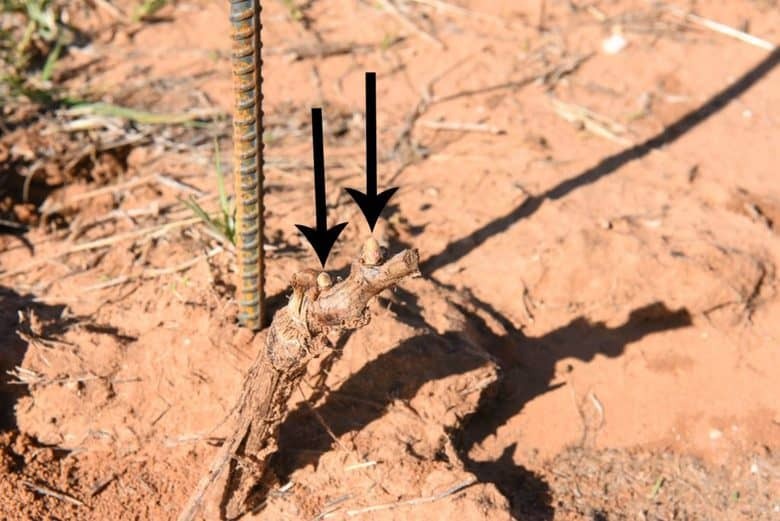 In the older vines, the arms are still being tied to the cordon wire using the Pellenc AP25. Two people are working their way through the vineyard tying any arms that are loose or new arms that have yet to secured to the cordon wire. The house also sustained minor damage to the exterior EIFS. I did not take pictures and it will be a matter of time to reapply the color coat. This has definitely been a week of trusting God and remembering that He is in control and is taking care of us! For me, it has also been an exercise in letting go of my expectations. The vines were so loaded with fruit that I had the house finished after harvest and moving upstairs next spring or summer! I know that any plans that I might make or have, God’s are much better than mine. So, it will be exciting to see what He has in store for us! How about you – when was the last time you had to let go of expectations? Leave a comment – it is always encouraging to hear how others are handling God’s character building! Ah, so that’s the big news. No wonder you all needed some encouragement. What a blow. I’m so sorry. It’s always painful to see your cloud castles crumble away. But it sure can be fun to rebuild them with new additions! The last time I had to let go of expectations? It seems like every other day, but a significant expectation was last fall. My mother, sister, and I share a home (that’s a different ‘change of expectations’ story) and were planning on moving to a new home last fall. It was our dream home. Then mom was diagnosed with breast cancer. We knew we couldn’t move during this and had to terminate the buying contract. But the last six months have been incredible. My SIL and niece needed to temporarily move in with us and we’ve enjoyed it so much we’re looking at how to incorporate them into our long term living plans. If you asked most people, would they rather live in their dream home or with extended relatives, wouldn’t even think twice before saying the dream home. 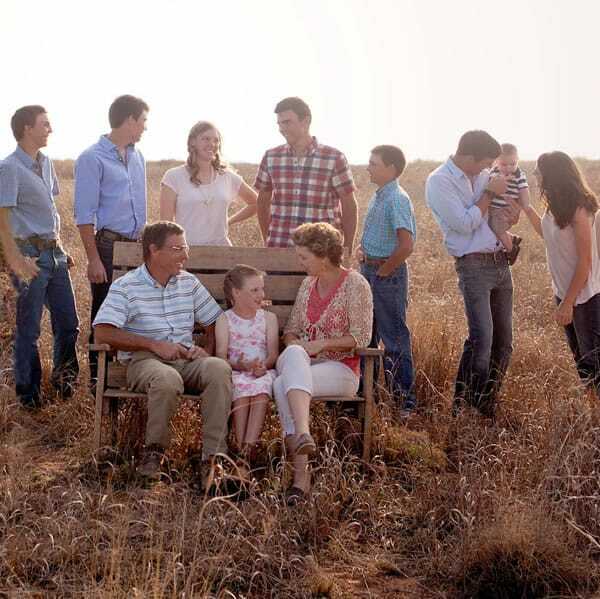 Now I can say with certainty that I’d take the extended family. To top it off, Mom’s cancer was easily removed with surgery and the doctors said she didn’t need radiation or chemo. Basically it was the easiest cancer ever. I am sad for you and your family, but I have to admit that I’m a little excited to see what fun adventures you come up with for the interim. Cherie, thank you so much for sharing your story and what a story it is!! I am so thankful your mom is doing so well and I can’t wait to hear more about your adventures! I always love your FB and blog posts. I am so sorry to hear about the hail damage to your vineyard. It is inspiring to read your story and feel your resilient spirit and know the strength for which that comes. 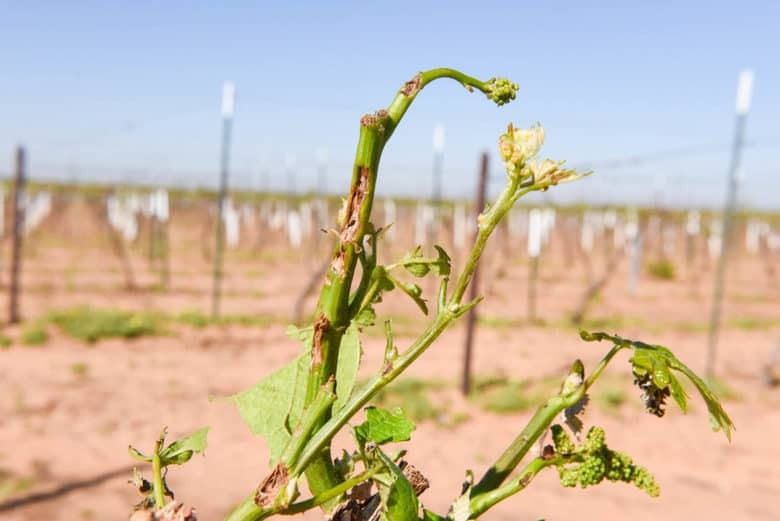 Praying your vines recover quickly and that you will have a fruitful outcome. Thank you, Madonna, I really appreciate your encouragement and will keep you posted! Thank you for sharing your trials with us. Thank you for your encouragement, Alexander! It is so true!